If I could title this post with a big eye roll emoji, I would. Not because of the movie, it was great, but because of what happened prior to the show. But first, let me back up a bit. A few years ago I created a private Korean Adoptees of East Tennessee (KAET) Facebook group. We all connected online and chatted here and there, but I definitely dropped the ball and we never actually met face-to-face. Fast forward to four years later. With the increasing ease to connect with others through social media outlets, Whitney from We The Lees, found and joined the KAET group I had created. We realized we had been following each other for a while on Instagram and were both in the same state. 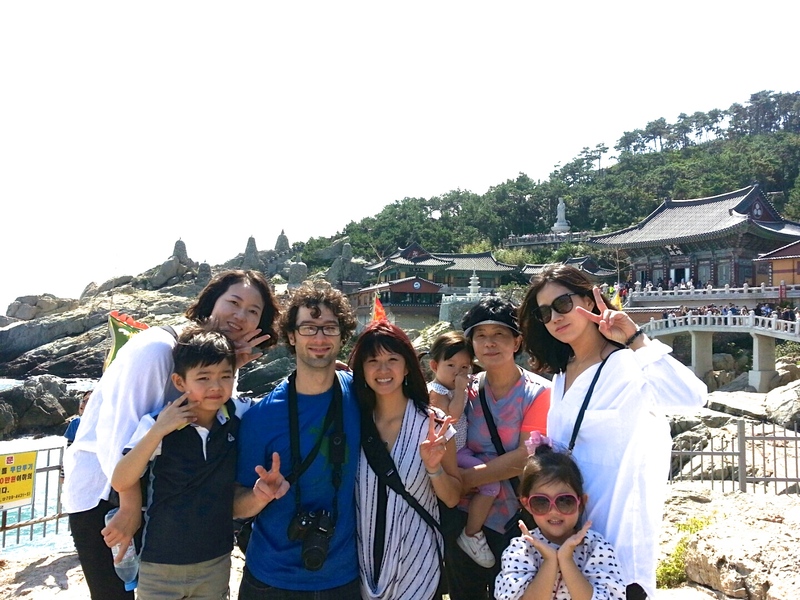 Well, Whitney and her husband Lee, also a Korean adoptee, are a lot more involved in the Korean adoptee community and started a private TN Korean Adult Adoptees (TNKADs) Facebook group…and it’s a thousand times better than the KAET group I started. Whitney and Lee are in Nashville and – from what I’m gathering – the majority of the #TNKADs group members are there as well. They’ve had several meet-ups already and I think a few of us #EastTNKADs were having some FOMO (fear of missing out) issues. So the east TN side got our butts in gear. We decided to meet-up and support the Asian community by going to see the new film, Crazy Rich Asians. I had all the feels about this…Nervous. Excited. Awkwardness. Hesitant. Uncomfortable. Excited – oh wait, I already said this. Once we all arrived at the theatre, we got our introductions and chit-chatted in the lobby. I told (noticed I said told, not asked) the group we needed to get a photo or Whitney would kill us. I wanted to get it before we went in because I knew I’d have to get home pretty soon after. Here comes another awkward moment. I was thinking that the significant others would also be in the photo so I didn’t ask one of them to take it. I stopped a daughter and mother and asked if they would please take our photo. Having just met, all of us adoptees lined up side-by-side, not touching in the least. It was like being back in middle school at the end-of-year dance, ha ha. The significant others backed away and the daughter took our photo. When giving my phone back, the mother said while laughing, “I bet I can guess what movie you all are going to go see!” I gave a chuckle and I think someone else in the group said something about Crazy Rich Asians. As we were walking to our movie, another adoptee and I were talking about that woman’s comment. This is why I am hesitant to do things with groups of other Asians. This is why I was a little bit uncomfortable. Thoughts in my head before that day: “I bet people are going to be staring at us and judging us because it’s a group of Asians going to see an Asian movie. Do I think like this because I was adopted and grew up in a caucasian community? I wonder if Asians that aren’t adopted even think about this or even care.” Not that I care about that woman’s comment…buuuut I do care. So the moral of this post: really think about what you are going to say to a stranger that doesn’t look like you. You don’t know their history. It’s one thing to think it, but another to say it out loud. #BeKind y’all! 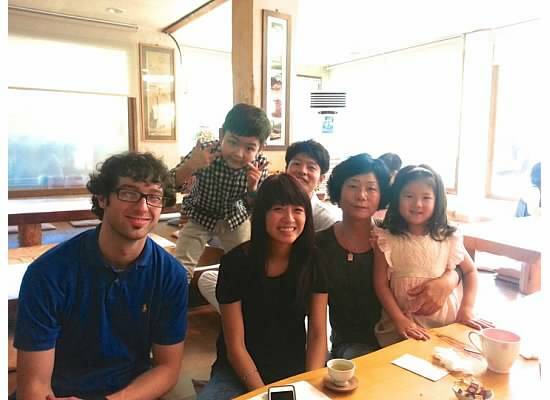 As I get older and with the increasing Korean adoptee connections I make through social media, I have started to pay more attention to the growing network and the issues we go through. So, join me in becoming a better person. First of all, I’m not really sure why I started doing these in “Parts” when it is turning out to just be the days. Oh well! Guess you’ll just have to deal. 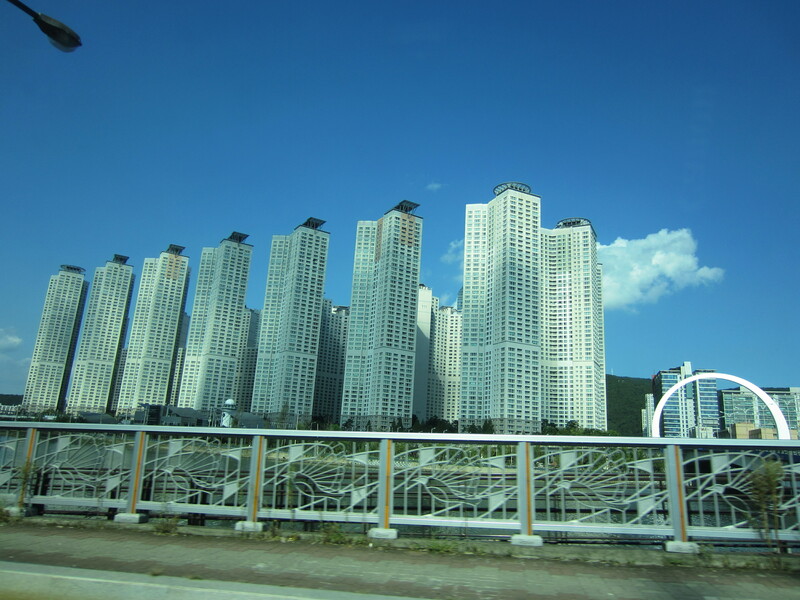 Sunday we were headed for Busan, South Korea. 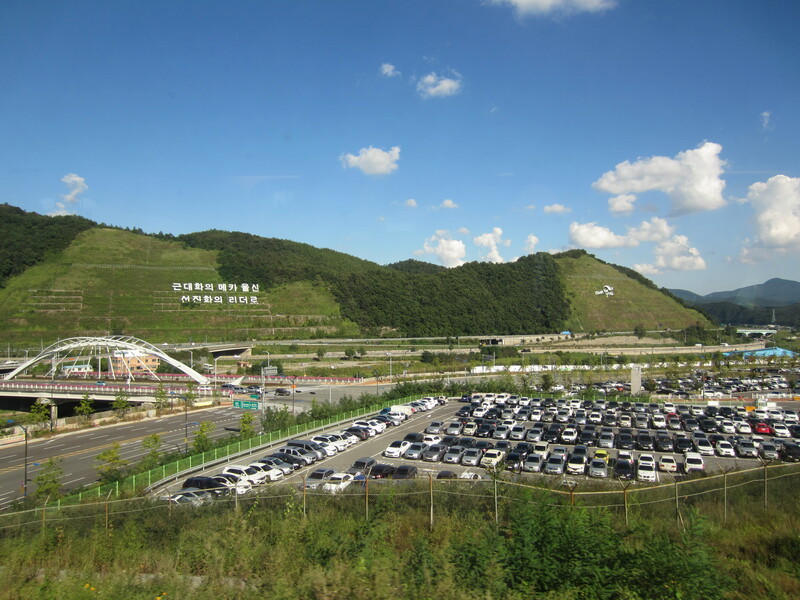 A good 1 hour drive away from Ulsan. But first, Daniel and I ate a very delicious breakfast that my birth mom made. Although, there was one dish that I did not care for at all. It smelled like wet dog. And no it wasn’t really dog. The kimchi was awesome and we found out that all the spicy sauces we really enjoyed were started from cayenne peppers. Nyam nyam nyam (the Korean equivalent of “nom nom nom” confirmed by EatYourKimchi ). Daniel actually ate CUCUMBERS. But only because he didn’t know it was cucumbers, but then he fell in love because they were kimchi-style cucumbers. We had a lot of octopus, fish jerky (don’t hate it was delicious), anchovies, and rice. Don’t worry, the only reason we loved this stuff is because it was covered in this delicious hot pepper paste, gochujang. Nyam nyam nyam. The photo I sent them three years ago. 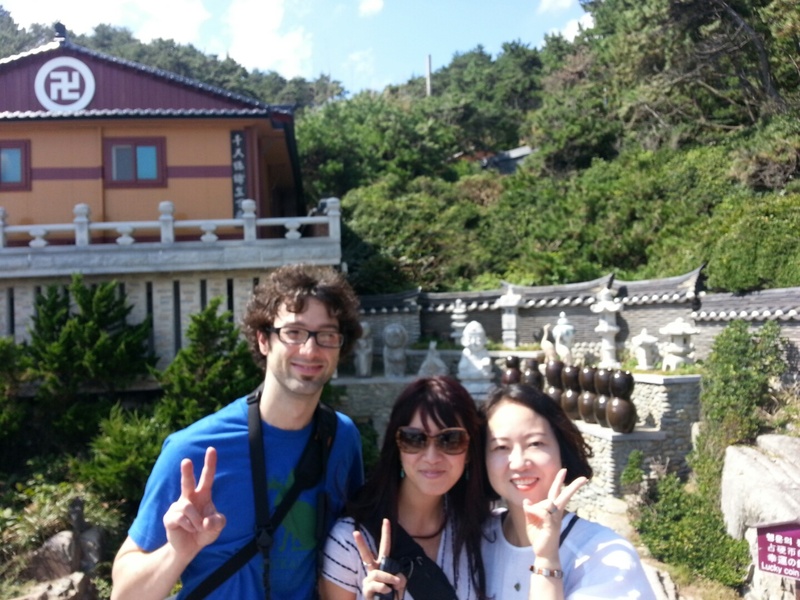 Three years ago, Ashley and I went to Haedong Yonggungsa Temple, in Busan. When Esther found my birth family and asked me to send some recent pictures to show them, I sent them one of me standing on the edge of a cliff with the Temple in the background. My birth mother had responded that this Temple in the picture was very close to where she lived. But little did I know, that my birth family only lived 1 hour away and had been there many times before. 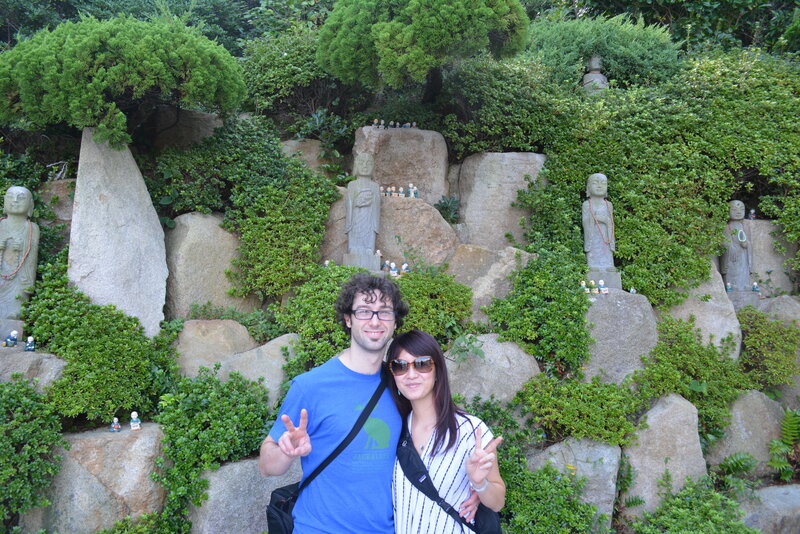 We got there first and walked around the entrance to the main Temple grounds. Twelve Chinese year zodiac statues line the way to entrance. So they of course wanted to take a picture of us in front of ours, Year of the Tiger. While we were taking pictures here, we noticed that a lot of people had selfie-poles. Look it up. You’ll get a good laugh. The anticipation grows as you walk down many stairs. 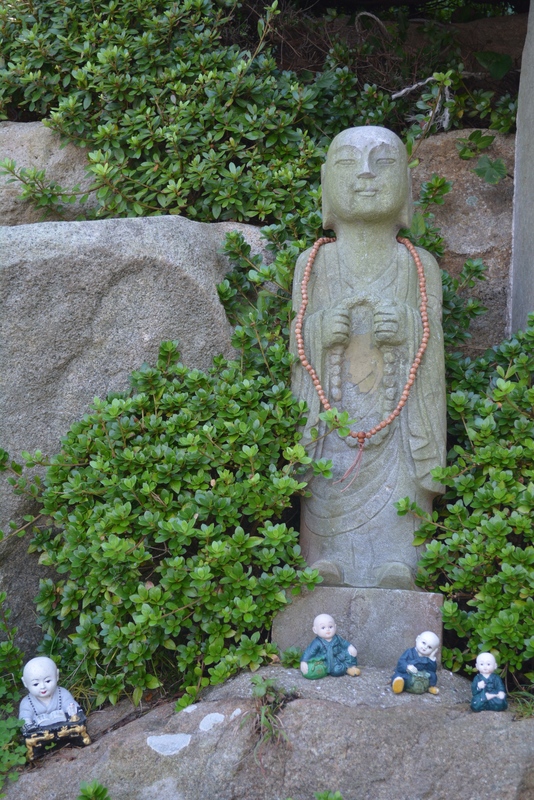 (Side note: I bet this place would look so awesome around Buddha’s birthday. Look up pictures if you have a second.) 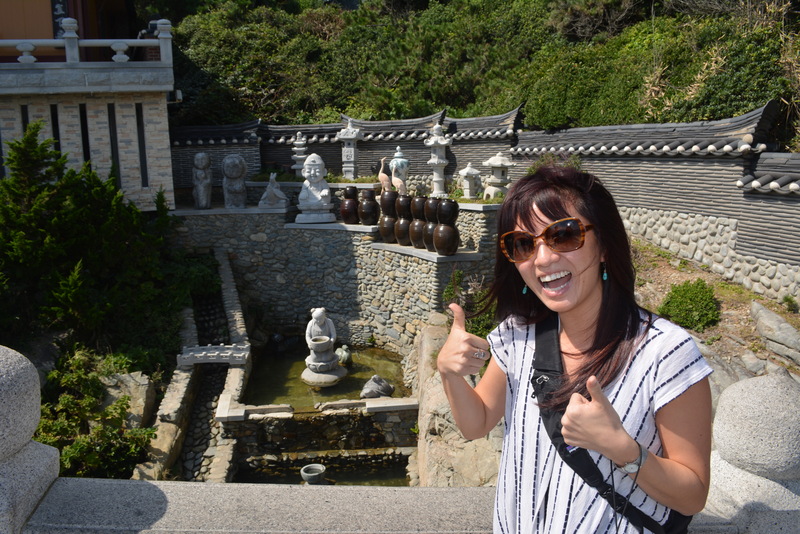 And then you finally arrive at a bridge where you have a great view of the famous cliff side Temple. There is an area next to the bridge here lucky statues have been placed. It’s called the Lucky Coin Division. There are two statues that you can try to toss a coin into. Min Shik gave Daniel and I each a coin. Min Shik tried and then Daniel with neither of them making one in. Then it was my turn and my coin banked off the wall and plopped right into the lucky turtle! “It was such a big deal that other people were turning around to see who got it in”, says Daniel. Lucky me! The rest of the family caught up with us at the main temple. Daniel and I were looking through a window to see the beautiful artwork that made the inside of the Temple. My birth mother went inside and prayed for Daniel and I. Mee Jin said she was praying for our safe arrival, for our visit, and for our reunion. 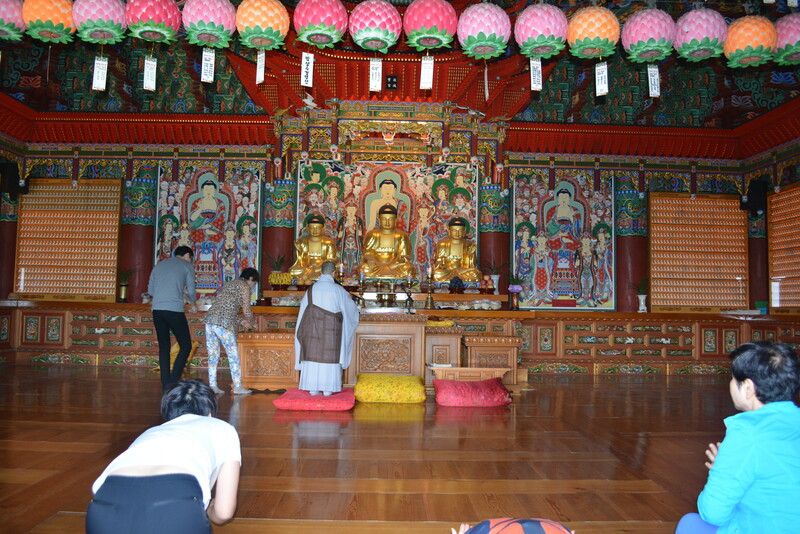 Then she gave us money to make a prayer to the big golden Buddha. We had to wait our turn and it was like we were little kids again. 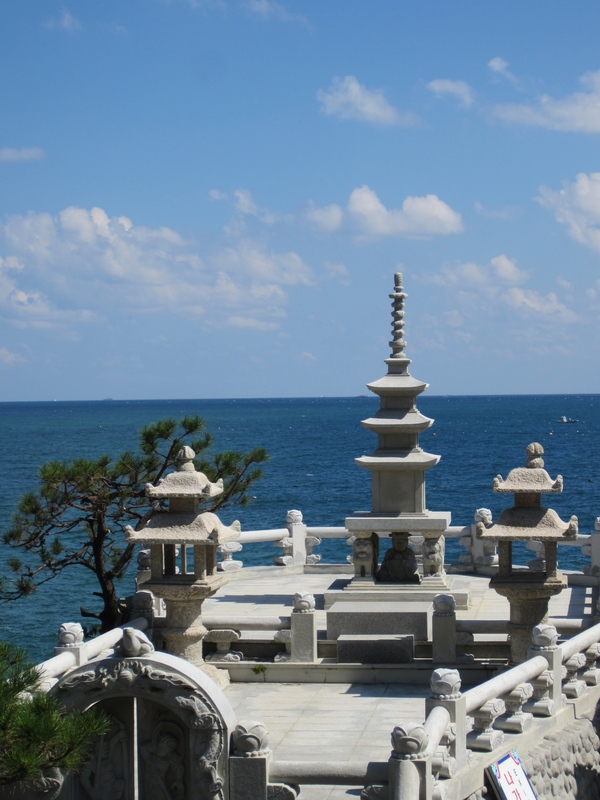 We eventually ventured our way to view the Temple from the cliff where I had taken that photo three years ago. 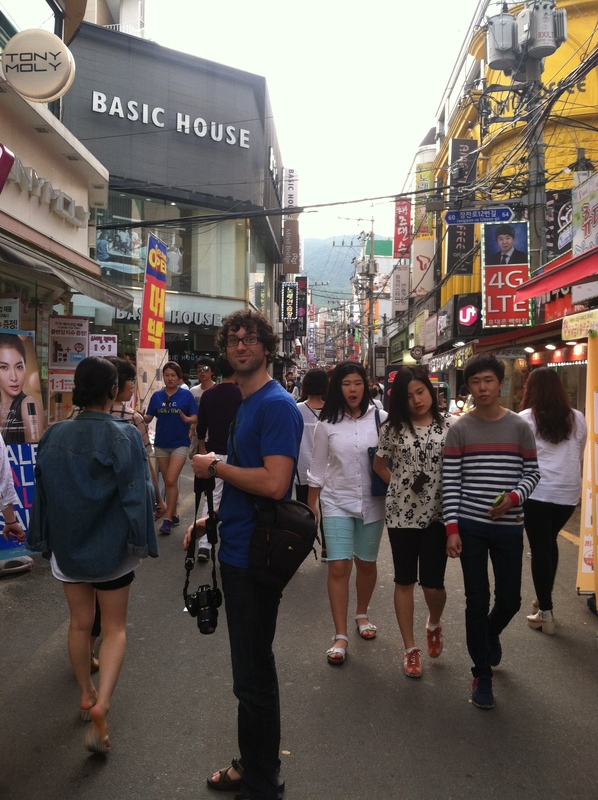 We got a group shot and they bought us a Korean pancake (hotteok) that was filled with sesame seeds and brown sugar. 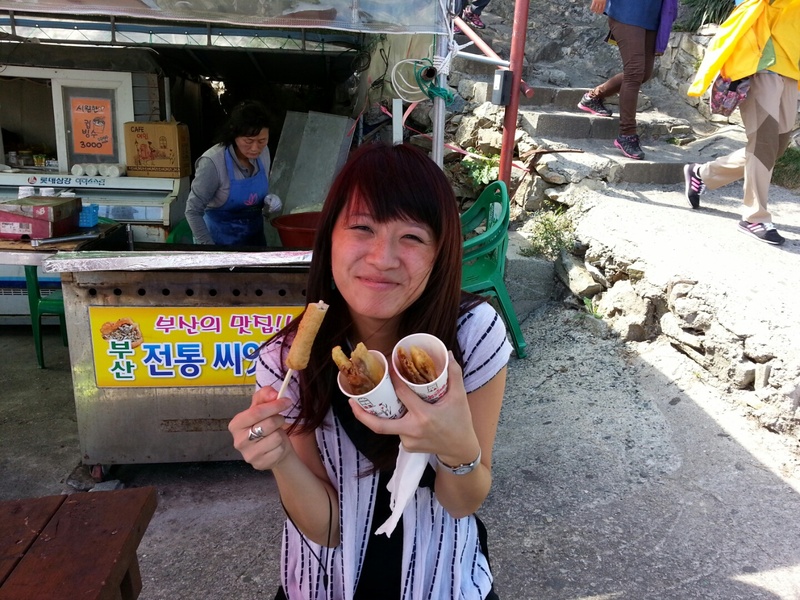 One of my favorite Korean street foods. They also got us some kind of fish on a stick that had the consistency of a hot dog. We were definitely not fans of that at all. As we left the Temple, my birth mom bought Daniel and I prayer wish beads and Mee Eun bought her daughter a bag of rice cakes. 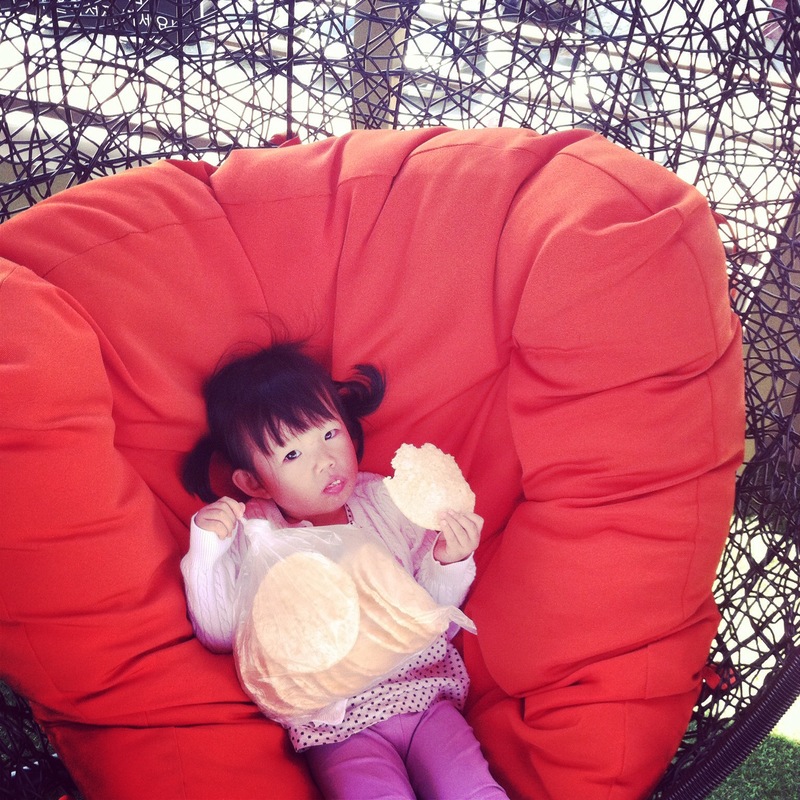 Which Mee Eun’s daughter later took that same bag of rice cakes and slinged them at her mom, my birth mom, and then went and sat in a chair and giggled about it. It was pretty funny. Have you noticed the amount of snacks and eating in general. I really don’t know how they are so skinny. We drove into Busan on an ocean-view road. We saw a ton of people surfing. We went to a -you guessed it- coffee shop. We went to an Angel-in-us coffee shop which I only note because Daniel just loved that a coffee shop had that name. 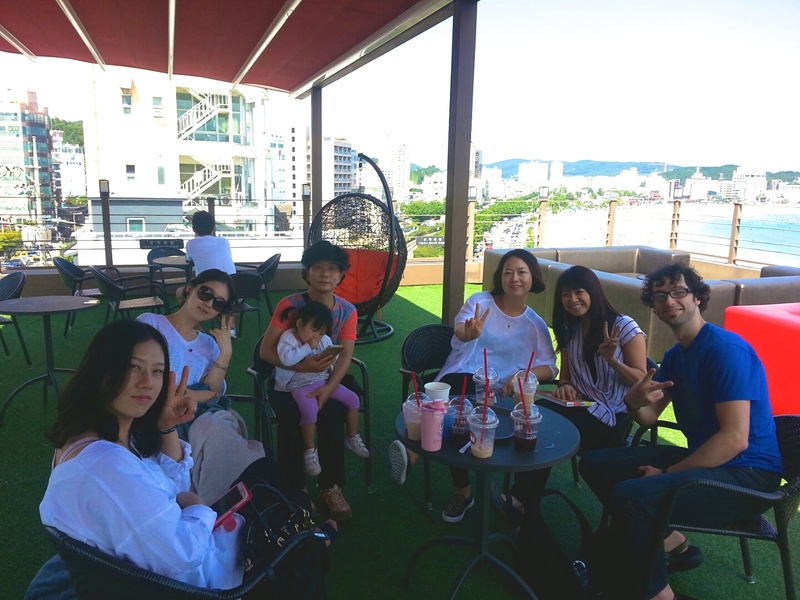 Hye Jin met us at the coffee shop. It looked like she had driven there and taken a nap. We went up to the rooftop that overlooked the Busan’s Haeundae beach. At the top Mee Eun said, “MeeRee. Booked for you!” because no one was up there. Of course she was kidding, but at the rate they were going I wasn’t sure! We took some pictures, sat around, drank ice coffee, and “talked” . Now, when I say talked. We really did talk, but it was super broken English and Korean. Although it was a bit more English than Korean. We showed them pictures of us and our families. Then talked about how each married couple met and how long they dated before they married. Mee Jin and Min Shik dated ten years before they married and they’ve been married for six years. She waited for him while he was in the Korean Army. Mee Eun and Ju Hwan have been married for four years and they dated for six years. Daniel said that he thinks Mee Eun had been married before, but I missed that somewhere in all the discussions. After coffee, we went to lunch before shopping in Dongdae around Busan National University. We went to this place that made something very similar to Japanese udon. We waited outside for a few minutes because one of my birth mom’s sisters (she has seven siblings, this might be including her I’m not positive) was driving from two hours away to eat and shop with us. 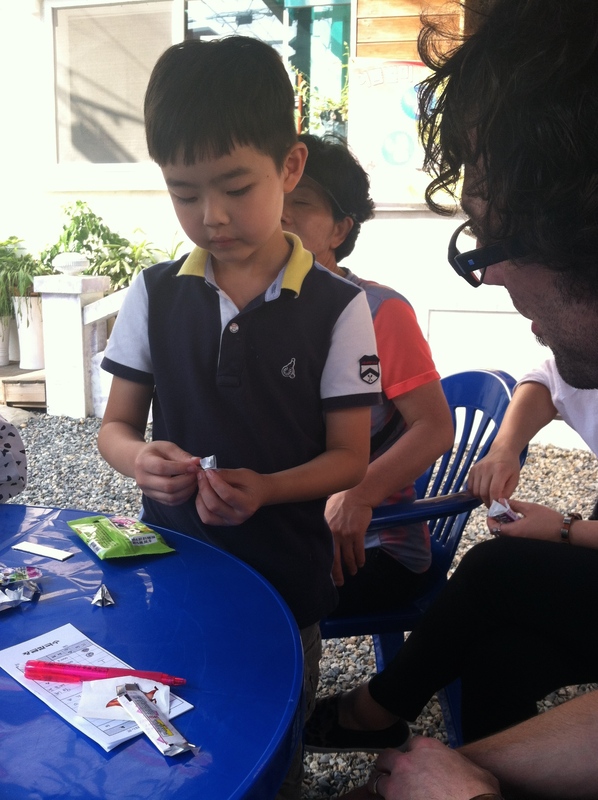 While we waited, Daniel taught Mee Jin’s son how to make a paper airplane and how to play drums on his legs (he’ll be a great Dad in the far future). Once she arrived there was a lot of Korean talking. She said I looked a lot like my birth dad and we ate lots and lots of food. 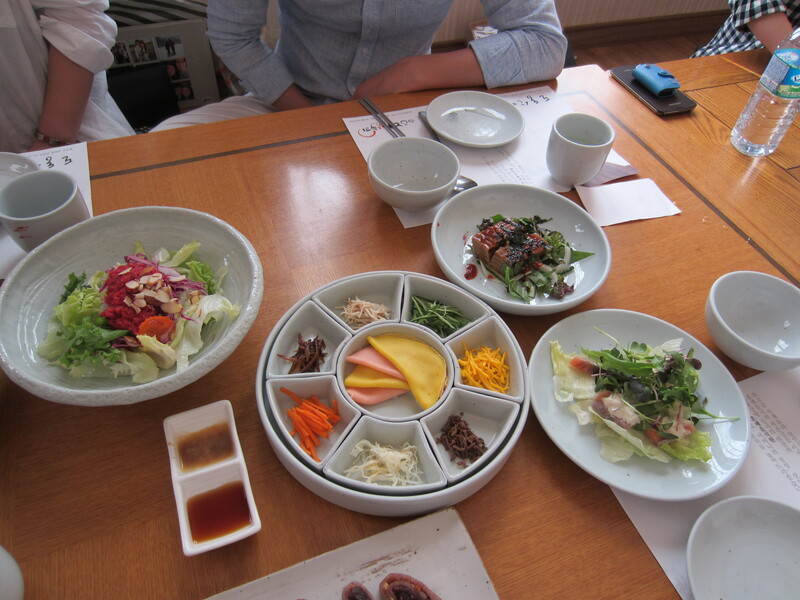 We had mandu – my favorite! While they all talked about us, Daniel and I showed Mee Jin’s son some video games that were on our phones and my mini iPad. At this restaurant, I also found out that Mee Eun found out about me when she turned 25 (I think she is now 33/34). But she was told to keep it a secret from the other two sisters. So Mee Jin and Hye Jin did not know about me until Esther found them. And apparently they cried a lot when they heard “MeeRee’s story”. After lunch we headed for the shops. Here is where the sweating began. And I literally mean sweating for Daniel and me. But before we headed to the alley/side street boutiques some more street food was bought to eat while we walked around. It was some kind of dried fish jerky snack. It was pretty good. Anyway. The shops there are a lot different than here. There aren’t a ton of department stores, at least not where we were. It was multiple streets of boutiques lining them up and down. 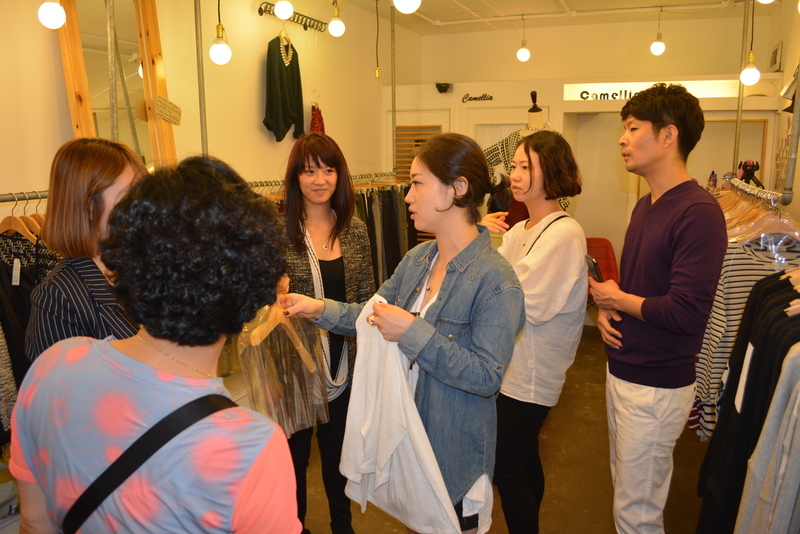 Hye Jin told us the quality of the women’s clothing was a lot better in these boutiques and the men’s quality was better in department stores. Daniel saw a pair of shoes he liked out in the alley boutiques but they didn’t have his size. Hye Jin said, “Daniel style no. Department store. Daniel style.” So we headed to the department store that was nearby to shop for Daniel. We tried to tell them they didn’t need to buy us anything that we had brought money to buy things. But we could tell they were starting to take offense to us not picking out anything. They said that if we did not pick anything then they would be sad, “It is the Korean way! Korean tradition!”. We went through the shoe department and looked at what seemed a ton of shoes. It was a flustering event. They picked out some shoes and while Daniel was trying them on Mee Eun could tell I was getting kind of upset. She asked what was wrong and I said that it was too expensive and that they did not need to purchase such an expensive item. She told me not to worry and said, “Auntie’s money. Pay for Daniel’s shoes.” Side note: When you haven’t seen family in a while the custom is to give the kids money. So when my birth mom’s sister left to go back home, she gave money to buy us clothes. 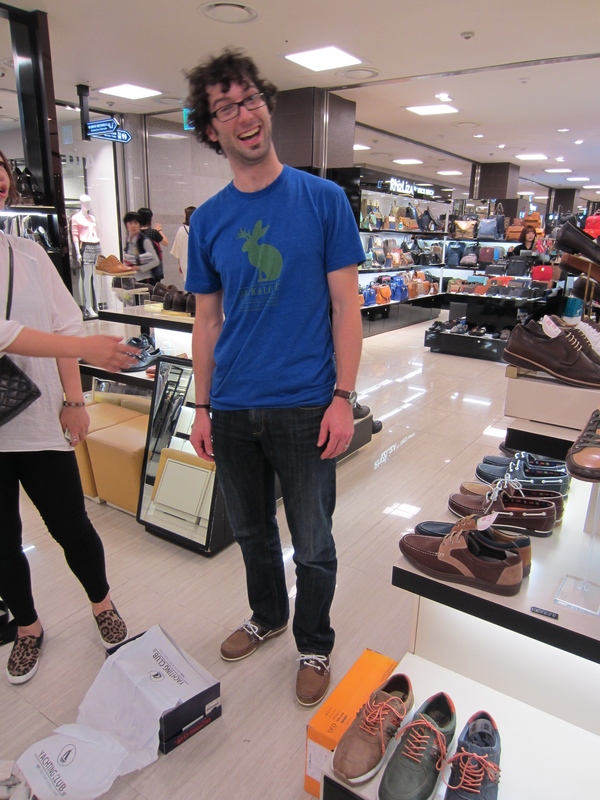 While we were in the department store, they also made Daniel pick out some shirts. My birth mom wanted to buy him some pants, but Daniel grabbed his thighs with his hands and said, “Daniel thigh big.” And then went up to a mannequin and put his hand around the thigh, “Korean style. Tight. No fit Daniel.” It was really funny. Then all the eyes were on me and buying clothes for MeeRee. I really didn’t want to offend them. I think we are all the same though in our humbleness. They bought me a dress, a jacket, a trench coat, two tops, and a pair of shoes. Daniel and I probably would have bought more, but we felt like anything we pointed at they would buy. So we just did some window shopping. Oh, they did buy us fun Korean socks too! 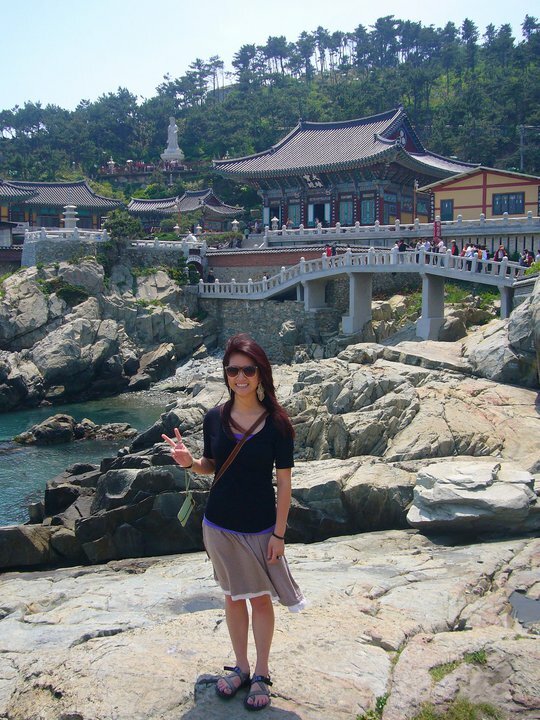 “Hye Jin’s style” became something we’d say a lot on the rest of the trip. She is the shopping Queen. She’s really into fashion and she did not like some of the things I picked out. But I’m probably more along the lines of Mee Jin and Mee Eun on the fashion style. Hye Jin would also get really frustrated with my birth mom because she would barter too much and embarrass Hye Jin. It was really funny because my birth mom would cackle at Hye Jin and make faces. I told Hye Jin my Mom would barter too because she likes to find deals. Finally, we thought we were done shopping. But. While sitting in the main entrance to the department store (which did not seem odd to anyone walking in and out nor did the fact that little children were walking back and forth or just plopping down in the middle of the floor), Mee Eun and Mee Jin said that they and my birth mom wanted to buy something for my Mom and Daniel’s Mom. Again, we tried to say no that we would buy it but they insisted. So we went back in and picked out some really pretty scarves that fit both of their styles. After picking out scarves and shopping until we dropped, we went to eat. We ate at the department store food court. Which was a great thing because Daniel and I were able to just share something. We had kimbap (Korean sushi) and tteokbokki/ddeokbokki. And I love both of those too! Before we leaving Mee Jin, one of Mee Eun’s daughters (who kept holding my hand that day), Min Shik, his son, Daniel, and I headed for the restrooms. The women’s restroom had VOMIT everywhere. Like you couldn’t even step over it. So the ladies headed upstairs and told someone about the mess. Daniel said that when the guys walked out and by the women’s restroom entrance Mee Jin’s son goes, “Oooooooooh MY GAAAAAH!” which was beginning to be absolutely hilarious with us because they said it so much. 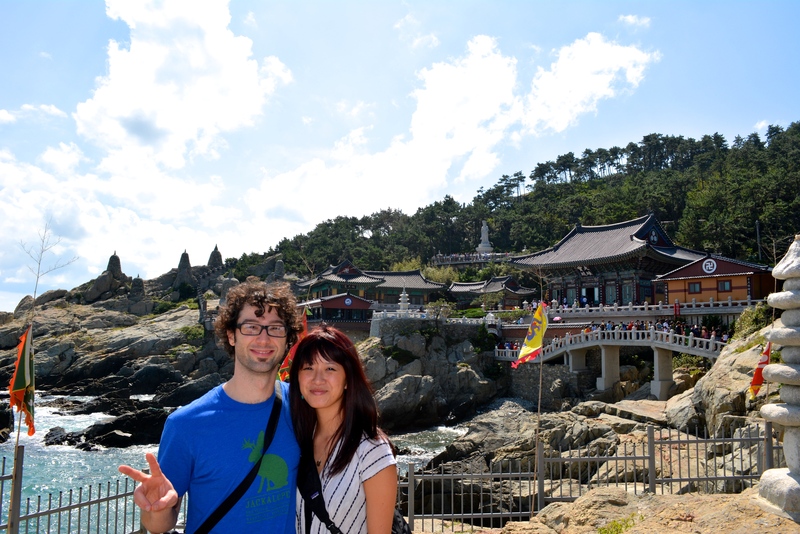 After this adventure, bubble tea was purchased and we headed back to Ulsan. On the way back, Jeong Hun was calling and telling everyone to hurry and get back. He also was apparently drinking. A lot. Then when we were within 5 minutes, my peanut-sized bladder couldn’t hold it anymore and Min Shik had to go to a park that was really close so that I could use the restroom. Mee Jin went too and when we got back the joke was to call anyone that had to go to the restroom during a drive, peanut bladder. On our drive back, Jeong Hun was sending me chats on KakaoTalk. He was using some translator that was translating older sister as “Lisa.” So I was really confused and thought he was under the impression that my name was Lisa. Thankfully Mee Jin was around and was about to translate his texts. And also mention that Hun Na (nick name from an older person to a young person) was at home drinking by himself and getting drunk. Mee Jin said when Hun Na drinks he gets more talkative. Hun Na called again and was crying (we could hear through the car radio) but we weren’t sure why. When we got back to the house, we all sat down to talk. Jeong Hun kind of hid around a corner, you could tell he had been crying, when we first got there. He had been home writing me letters (trying to at least) in English and my sisters were making fun of him. I felt bad for him cause something was obviously sitting very heavily on his mind. My sisters told me that he feels bad because I was given up for adoption and then he was born. I tried to tell him to not be upset because I understood the culture. I couldn’t figure out how to get this translated though and I started to cry. And if you know me, it is pretty rare to see me cry. I was getting upset because I couldn’t convey my feelings about this topic and I really wanted him to know that I understood. Then Daniel started crying and that made me cry. Seeing men cry makes me get teary eyed and maybe eventually cry. Yep, that’s how a lot of our conversations went. Daniel had a great time, but boy was he glad to be back home and speaking non-broken English. Hye Jin slept almost the whole way to Ulsan. She woke a couple of times when the food carts came by to ask if we wanted anything. 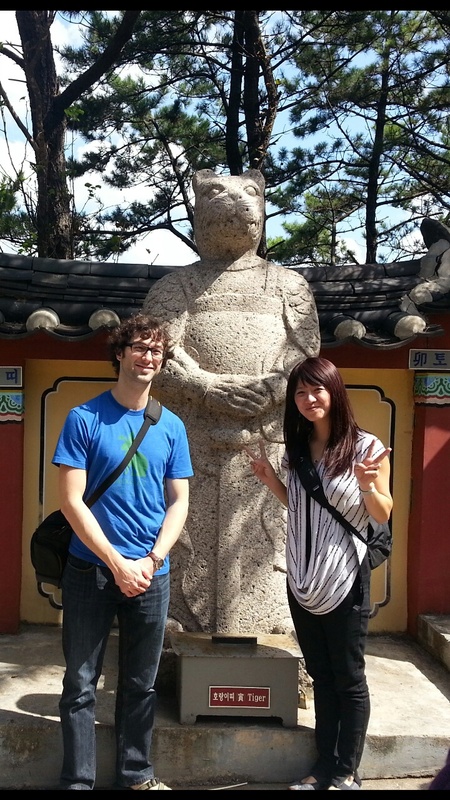 Daniel and I listened to our Pimsleur Korean lessons. Towards the end of our train ride, I really had to go to the restroom and I started to feel a little sick. Go figure. 1) We didn’t eat anything for lunch and had breakfast a little after 6. 2) We had Goldfish for a snack. 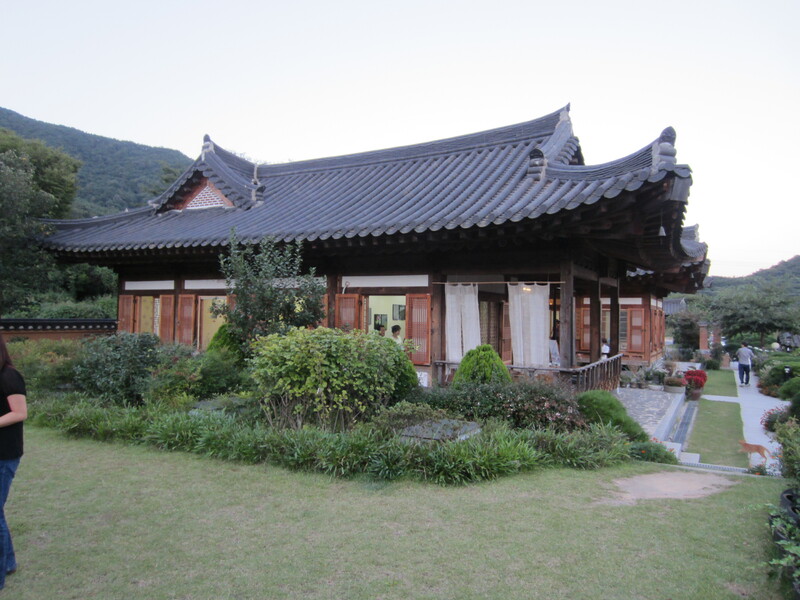 3) I had been reading and writing Korean from listening to Pimsleur. 4) I was getting nervous – about time some of you are probably thinking. Daniel was giving me a prep talk as we arrived, “Remember last night how Hye Jin hugged you for a while and you probably felt awkward? Well, your birth mom is probably going to hug you a lot longer. She birthed you, so prepare and get over it. ” haha Love him. We arrived at the Ulsan station around 3:30PM UTC. I followed Hye Jin and Daniel off the train. I remember seeing Hye Jin and Daniel getting hugged by people but I wasn’t sure by who at first. I seriously thought I was going to throw up or pee my pants (I love Southern sayings). As soon as I stepped off, I was instantly grabbed, hugged, and held on to by my birth mom. She started crying and then, of course, I started feeling awkward. I just did my awkward little laughter and told her not to cry. I looked at Hye Jin for help and she was rolling her eyes and laughing. Hye Jin and another voice were apparently telling her to stop (like how kids would whine at their parents to stop kissing or hugging them in public). She finally let go and moved on to Daniel. 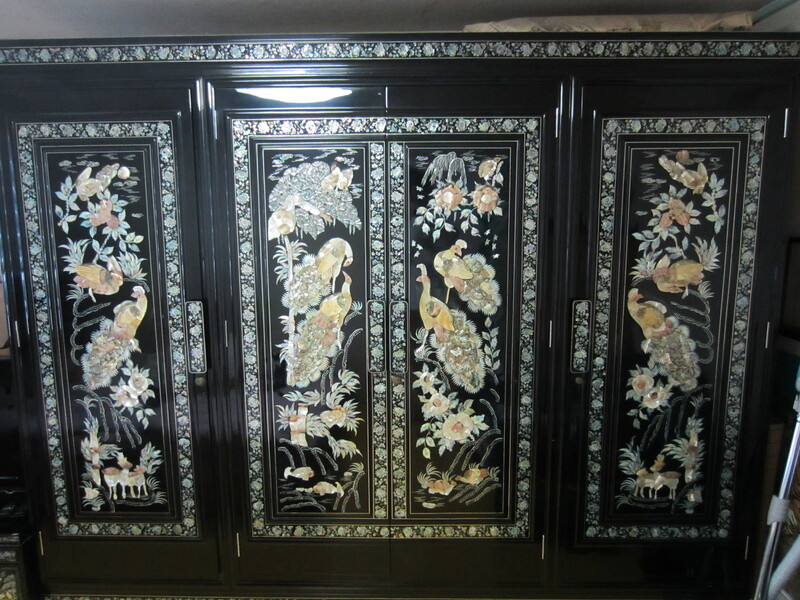 The other voice, I had noticed while I was getting squeezed to death, was the first-born daughter, Mee Jin. 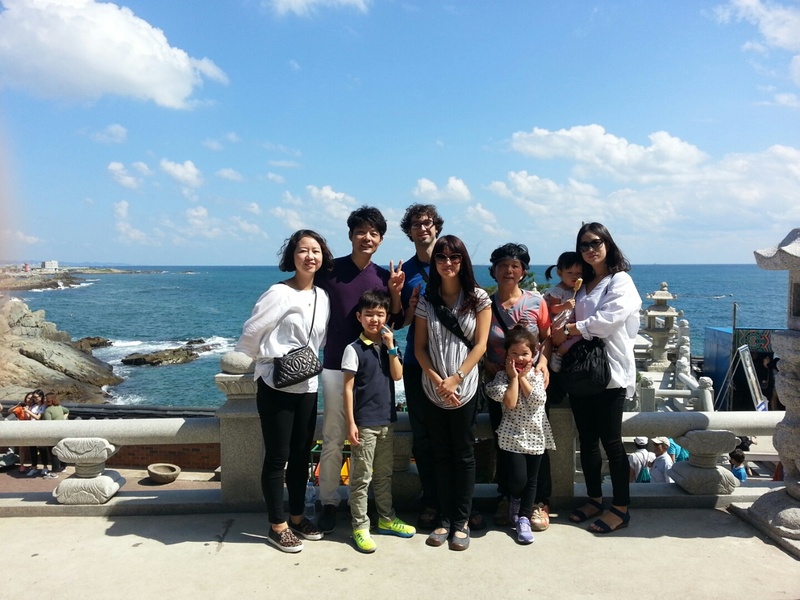 Her husband, Min Shik, and son, Seong Hyeon, had come to greet us at the train platform and hugs were given to all. Hye Jin finally let it be known that I had to use the restroom so we made our way downstairs into the Ulsan KTX Station. I wrote in my travel notebook that everyone (including the Hotel staff) already reminded me of home and the South. Everyone, it seemed, was trying to make us feel very comfortable and at ease. I walked out of the restroom area and took my time walking back to the group so I could observe from a distance for a second. Min Shik, who we found out knows a decent bit of English, was trying to converse with Daniel. (Journal entry side note, “I am so very thankful that Daniel was able to be with me. I don’t think I would have reacted or been as solid as I was yesterday if he wasn’t here. I think I would have been really frustrated at the language barrier and become homesick real quick if he wasn’t here.”) While Mee Jin and Hye Jin went to get some snacks(Dunkin’ Donuts), Mee Eun(second-born) arrived. Boy, is she tall! We all stood around for a few minutes and stared at each other. They kept asking us who we thought I looked like the most. I definitely agree with Daniel that I look like all three sisters combined. I’ve got a little bit of all their facial features. We finally left the train station with our next destination about 30 minutes away. We had dinner reservations at 5:30 and were going to have tea and pastry snacks beforehand. 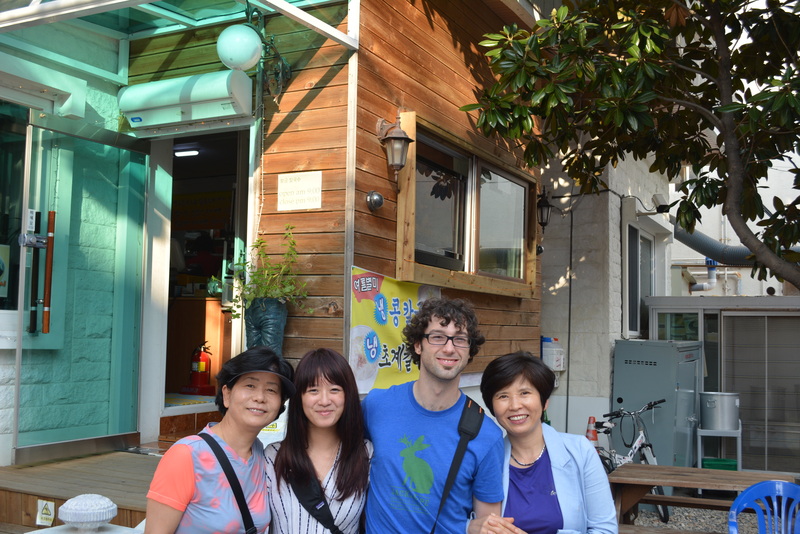 We rode with Mee Jin and her family to the restaurant. They must have been very worried about us because they kept asking if we were ok with Korean seating. If you don’t know, most Koreans sit “Indian-style” on the floor at a table to eat. No chairs. We told them we were fine and understood the culture. In all honesty, I think they were more worried about Daniel because every time we went to a restaurant they asked about his legs and told him to stretch out. 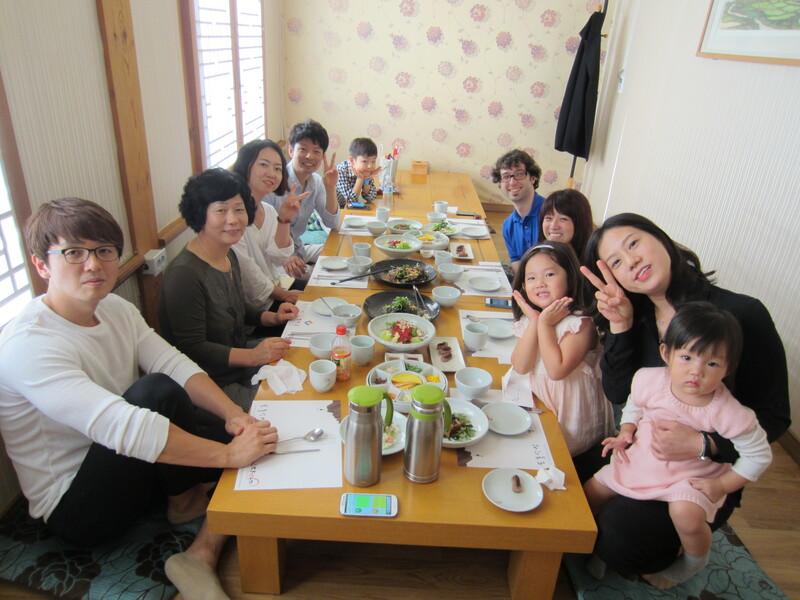 We arrived at the restaurant and were greeted by three more family members: Ju Hwan, Mee Eun’s husband, and their two daughters Yeo(sounds like yay) Jin and Yeo So. 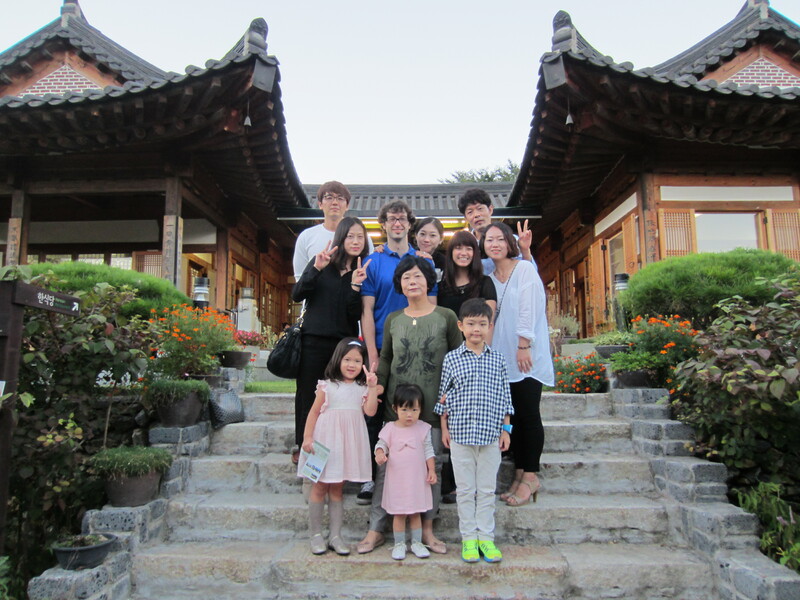 While we had tea and our pastry snack – I don’t think I saw one donut – Mee Jin pulled out her notes, introduced the family, and told us to please speak and tell them if there was anything we needed during our visit. Dinner was at a traditional Korean house, so it was a traditional Korean dinner. Meaning, that there were many courses and they just kept coming and coming. Before we got our food and drinks, I gave them all their gifts which they loved (thanks Becky!). My birth mom was hugging her photo album and keeping it away from the little ones. We had a Korean wine, makgeolli, which looked like a thick pink-orange drink. It was delicious. They told us to be careful with it or we’d have a headache the next day. Dad, you’ll need to learn how to make this one. (Side note – I don’t think they drink that much at all so I’m sure Daniel and I worried them. Mee Jin, my younger brother, all the husbands, and me are the only ones that really drink.) Daniel and I think the water was fine to drink there. We drank some from the faucet but everywhere we went water bottles were used. At restaurants we aren’t sure if the water came from the faucet or not, but at my birth mom’s house she used bottled water for drinking water. Did I mention there was a lot of food at this restaurant? They fed, literally, Daniel and I this one thing that looked like sandwich meat with sides that they rolled inside of it. There was a lot. Octopus, squid, beef, noodles, soups, beans, duck, and different styles of kimchi. All of it was yummy. By the third round of food I was so stuffed, but they said there was still more! And when you wanted it the least, rice came last. Keep in mind, we were at a traditional restaurant, so this amount of food was not normal. Which is a good thing or you’d see a lot of overweight and obese Koreans. After eating, we went outside and had a mini-photo session. 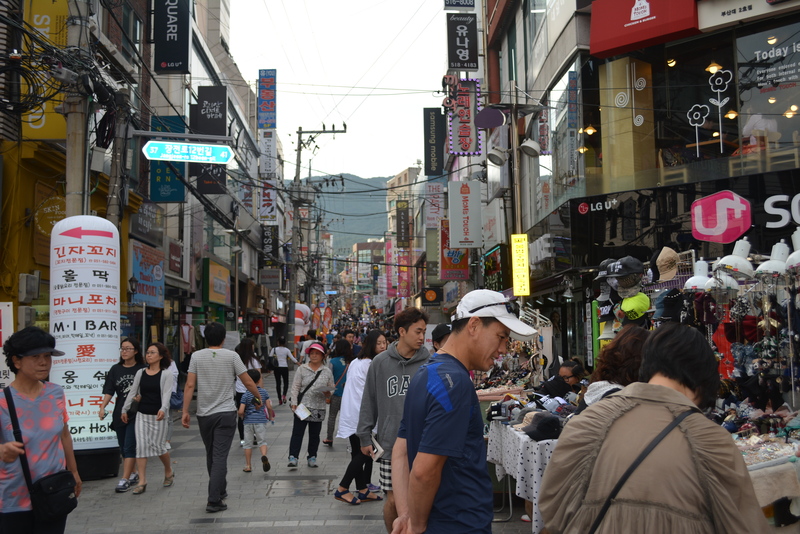 Then we headed to, what I am assuming is, Downtown to a Hanbok store. Jamie, my Korean teacher, had told Mee Jin that if possible I wanted to get a Hanbok. At the restaurant, Mee Jin told me that it usually took 7 days to make one but they found a shop that would have a customized one ready by Thursday. 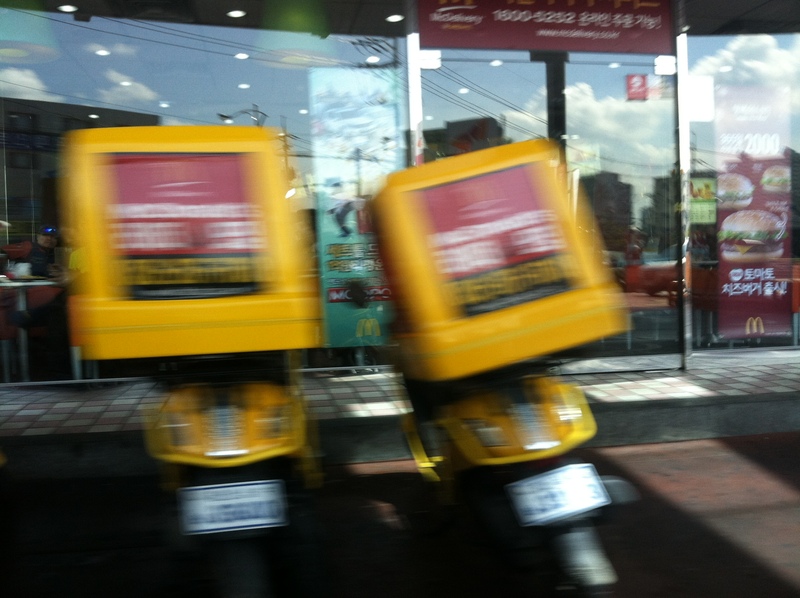 We rode with Mee Jin, Min Shik, and my birth mom to the Hanbok store. Mee Jin proceeded to tell us our schedule for our visit while Daniel and I fell asleep during the 20 minute car ride. We were woken up to rushed sounds to get out of the car. I wish I had a picture of Daniel’s face because he was so confused. We walked into a store with so many beautiful and bright colors. We – well my sisters and birth mom – started looking at different fabric colors that the seamstress already had laid out. It didn’t really register with me but we were picking out every aspect of my Hanbok. After picking out everything for mine they all turned and looked at Daniel, “Daniel’s turn to pick!”. He was getting one too, even though he tried to tell them no, no, no it was just for MeeRee. But they didn’t listen and Daniel got to be flustered too. 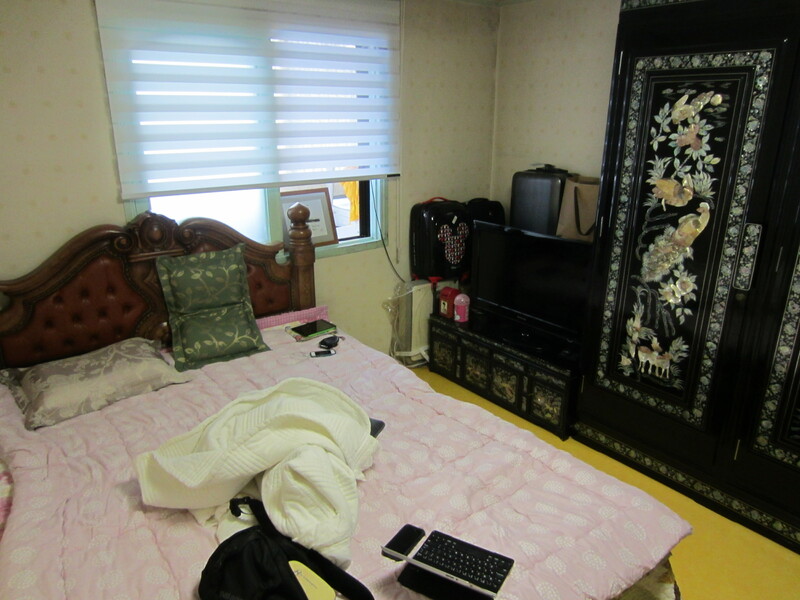 After the Hanbok store, we went to Mee Eun’s house. They had apples and grapes (they peel their grapes) but Daniel and I were still full. We got to look at a baby album of Mee Eun and Daniel and I noticed some similarities of Mee Eun and me in baby photos. Mee Jin, the planner, and the rest of the crew decided on what time to leave the next day and we headed to my birth mom’s apartment. They all live in apartments because they live in the city. Min Shik’s parents live in the “country” so they have a house, but never really saw anything but apartments while we were there. My birth mom lives on the fifth floor with no elevator. She has lived in the same apartment for thirty plus years (ever since she got married to my birth dad). There isn’t much furniture. If you sit anywhere in her place, it’s going to be on the floor. Unless you want to get on the exercise bike on the balcony where they dry and wash their clothes. 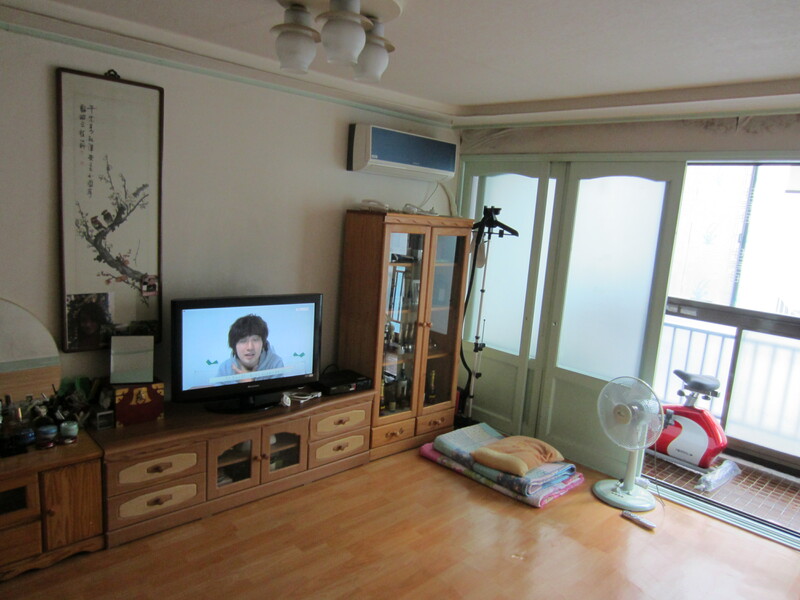 She has a kitchen area with a good amount of appliances, a little balcony off from that; a bedroom that Hye Jin turned into a closest with a space big enough for her to sleep and have a desktop computer; one bathroom that is also where you wash using a shower hose attached to a water faucet; a “master” bedroom that has a hot STONE bed with no mattress, one huge ornate dresser that she has had since she has lived there, and another little dresser; and then a living room area with a piano, a vanity-like piece of furniture, and some storage furniture that takes up one side of the wall. 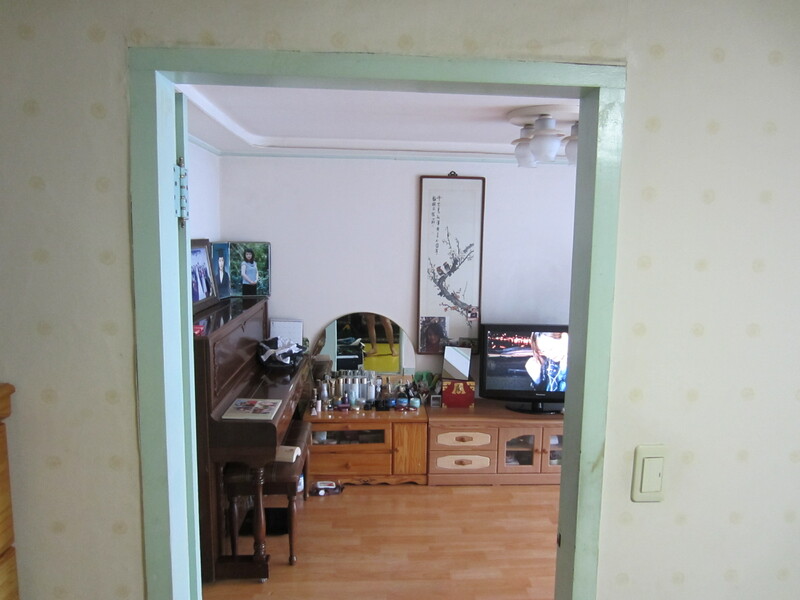 Jeong Hun and Hye Jin still live at home, but that night Jeong Hun stayed somewhere else. I think because there were many people in the apartment. So we didn’t see or get to talk to my younger brother much that night. Daniel and I finally got to get ready to head to bed. It was probably early still for them but we were drained. I got asked why I did not use face cream at night and only in the morning, which I learned that they use a lot of facial products. And I remember it took a while to translate/communicate that I only used face cream once a day. I wasn’t really sure why that was a big deal and I still don’t really know. I think they are just really into facial products. I remember waking up in the middle of the night, after lying on my left side for a long period of time, and it hurting so bad. The next morning Daniel and I both said, “Stone beds are not for me.” We also were really hot. There is no air conditioner in her place. Just a fan that she would later give us to put in the bedroom. Come to think of it, I don’t think air conditioners are a big thing in Korea. A lot of places had fans. Shew, I’m tired! This was a lot for just one day. I did pretty well writing in my travel journal about Friday, Saturday, and Sunday. That’s why the posts for those days will be so long. But then the rest of the time, we stayed up so late that I wasn’t able to stay awake or wake up early enough to write in my journal. But I did try to make notes throughout the day so that it would jog my memory of what I wanted to write about. 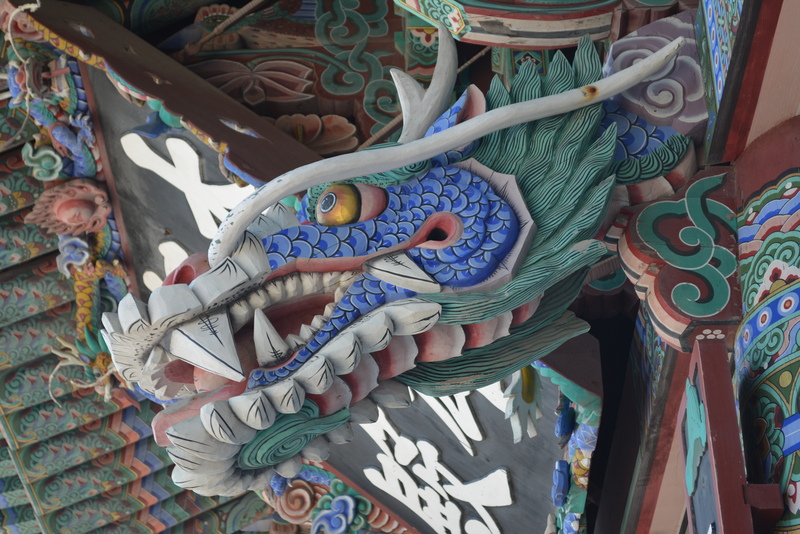 Next on the “Meeting the Birth Family” adventure: Breakfast; Busan adventures involving a temple, coffee, lunch with a special guest, and shopping; and an emotional night with Jeong Hun.